We kick-started our blog series by talking to writer and performer Adam McNamara. In the next of our ‘Meet the Cast’ series we talked to Andy Clark, who will play Davey (Sparkles) in Stand By. You may recognise him from TV series River City or recent theatre show Music is Torture (Biding Time and Tron Theatre). Here, he talks about how he got into acting, the timely and current appeal of Stand By, and that tea (and Soy Milk) is essential on tour. 1. How did you first get into acting? My local minister was a brilliant man who doubled as the pantomime dame every Christmas. He was a bit of a hero for me. When I saw him up on stage or in the pulpit, I knew I wanted to be some kind of performer. I joined the Blairgowrie Players when I was fourteen and played a chorus boy in Jack & the Beanstalk. I’ll never forget the first night singing ‘Zip A Dee Doo Da’ as the curtains opened. It was the biggest thrill of my life. 2. How do you choose what projects to work on? I’m not fortunate enough to be presented with scripts or offers every week but at the same time I don’t have to choose the first job that comes along. If I’m lucky enough to be asked by a director to be in a play with a good script, then I’ll be part of it. You know instinctively if you can play a part. 3. Do you have a favourite project you’ve worked on previously, and why? Hamlet at the Citizens was a great experience. I was in great shape, did my homework and enjoyed playing it. A lot of school kids and people who’d never been to the theatre got it, which in my opinion is the point of the job. Playing Widow Twankey at the Macrobert was a hoot as well, though. Andy Clark as Hamlet, with Sam Heughan as Guildenstern at Citizen’s Theatre. 4. What was it about Stand By that appealed to you? I like Stand By‘s originality and its ability to make salient, hard-hitting points whilst also being incredibly funny. I like the idea of it being in a confined space and the tensions that creates. I also like the fact that it’s set in Dundee. 5. Why do you think Stand By is an important play? Not many people know what it’s like to be on the force. We see the headlines but the pressures that the police are under go way beyond the mainstream media soundbites. The Governments’ actions are affecting them, and us as a society. Adam, the writer and fellow performer, really nails that. From left to right: Jamie Marie Leary, Andy Clark and Laurie Scott. We see the headlines but the pressures that the police are under go way beyond the mainstream media soundbites. 6. How would you describe your character? Pragmatic, mercenary, dogmatic. A realist. 7. How do you want audiences to feel, having watched Stand By? It’s not our job to concern ourselves with how to make people feel. Our job is to tell the truth and let the audience make up their own minds about how they feel about what they’ve seen. 8. Can you describe Stand By in 3 words? 9. If Stand By could have a full soundtrack, what 3 songs would be on the album? 10. Do you have a pre-show ritual before going on stage, or is there a specific item you carry with you when on tour? My preparation varies from show to show. Horses for courses and all that. I’m never without a wee bottle of Soy Milk so as I can always get a cup of tea on tour. Stand By will preview at The Byre, St Andrews from 4 – 5 August, before making its Festival Fringe debut at Army@The Fringe in association with Summerhall from 11 – 26 August. 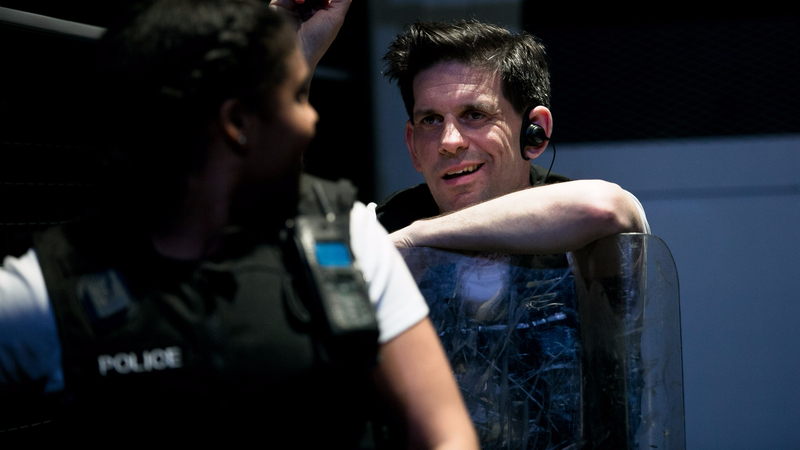 The brand new police drama will embark on an Autumn Tour from August and throughout September, with full details here.